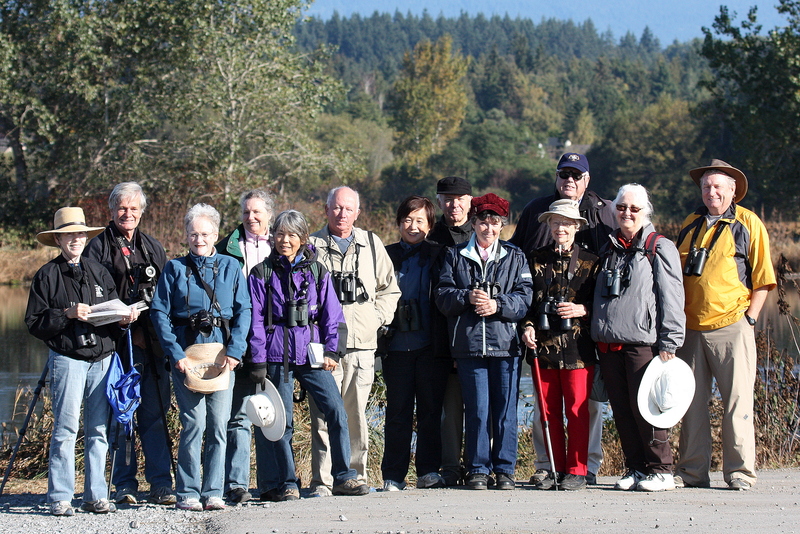 Fourteen DNCBer’s enjoyed another gorgeous Wednesday morning of birding at Iona Regional Park and the adjacent Sewage Lagoons. Hi-lites included: three Ring-necked Ducks, Western Meadowlarks, lots of other Duck and Shorebird species, our first newly-arrived Snow Geese and some tasty goodies from Kay, Eleanor and Lorna. 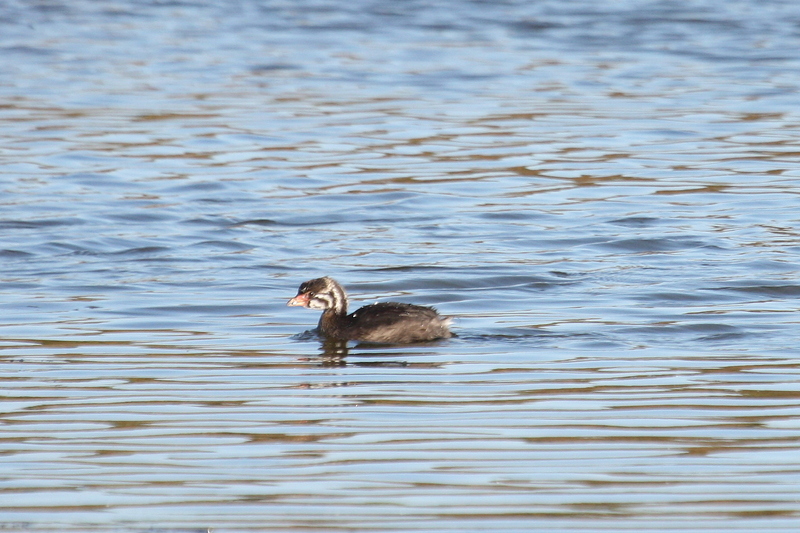 Check out Terry’s and Ken’s awesome photos of this outing on our Picasa site https://picasaweb.google.com/dncbirding which you can easily link to from our Blog at www.dncb.wordpress.com. Two carloads left Petra’s shortly after 7:30 a.m. Roger had Mike, Lorna, Eleanor and Kay in his car. I had Jane, Terry, Hans and Sheila in mine. 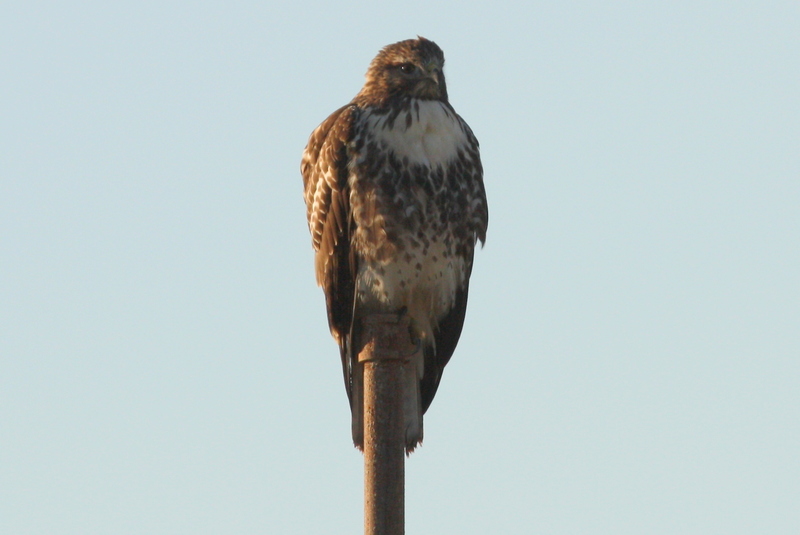 We stopped to photograph a Red-tailed Hawk on the airport fence. Marion & Marti and Ken & Anne were waiting patiently at the Iona parking lot when we arrived just past 8:30 a.m. Rush hour traffic was horrendous, even for us in the HOV lanes. Fortunately, the annoying drivel from my passengers kept my mind off the traffic congestion. Then, the tree at the parking lot, full of Warblers, got us all excited. We got good looks at Yellow-rumped and Roger saw an Orange-crowned Warbler. We had a quick scan out from the beach and saw a covey of American Coots and lots of Surf Scoters, but no Shorebirds, even though the tide was in. The morning sun was facing us, so we decided to quickly walk to the ponds towards the sewage lagoons. Lots of House Finches, American Goldfinches, Spotted Towhees, Sparrows (Savannah, White-and Orange-crowned), Northern Flickers seen along the way. A neat Anna’s Hummingbird “helicoptered” in front of us for a nice look. In the west pond were several species of waterfowl including American Coots, three Pied-billed Grebes, Green-winged Teal, American Wigeon, Gadwall, Northern Shovelers, Northern Pintail, Mallards and three beaut drake Ring-necked Ducks (one had a tuft, but wasn’t a Tufted Duck). 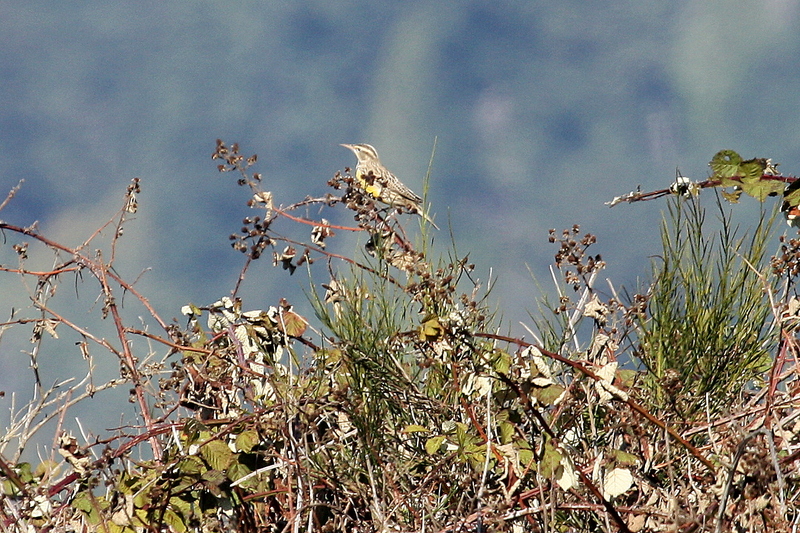 We heard several Marsh Wrens and Marti heard a Common Yellowthroat. We entered the back gate into the Sewage Lagoons and were a bit surprised/disappointed at the lack of Shorebirds in the ponds. 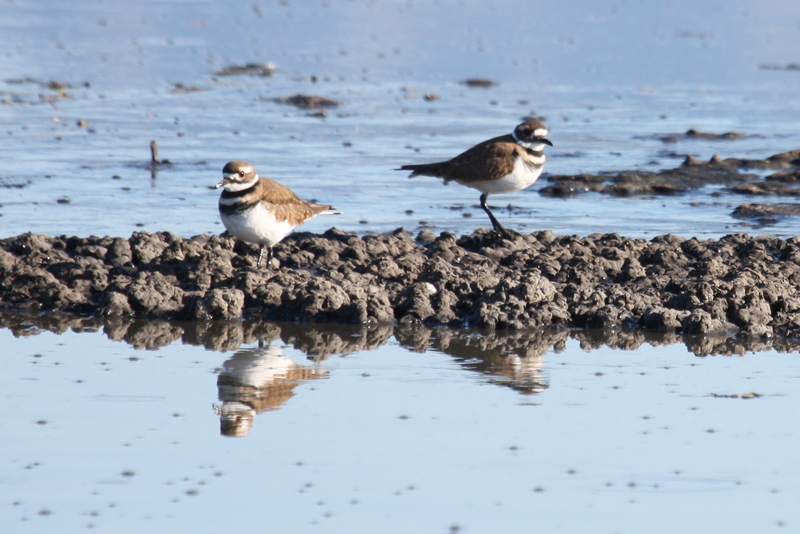 There were several Killdeer and Ring-billed Gulls in the first pond. As we wandered around the four ponds, we saw several other Peeps, and spent an inordinate amount of inarticulate discussion trying to ID them. I’m fairly certain we saw Least and Western Sandpipers, perhaps Semi-palmated. Marion’s Pectoral Sandpiper with two Dowitchers (Long-billed?) were foraging in the mud among some ducks. Check out Terry’s photos for ID confirmation. A small Hawk (Cooper’s/Sharp-shinned?) disappeared too quickly below the bushes toward the river as it was being mobbed by Crows. We left the Sewage Lagoons and followed the trail along the back fence (past Peter & Ken’s Swallow Boxes) toward the river. It was very quiet; the Bluebird boxes were empty and no wintering diving ducks have arrived yet. The Tug Boats and Lumberjacks on the river were replacement entertainment, so Ken photographed them. We walked along the meadow road and finally saw a Western Meadowlark where they often are seen in the Winter at Iona. We walked back to the parking lot and washrooms via the beach, enjoying the sun and warmth. A couple of flocks of Snow Geese (lots of juveniles among them) circled us and landed near the beginning of the breakwall. In the parking lot, Kay treated us with some cherry tomatoes and funny candies, Eleanor a tasty nut bar, and “old reliable” Lorna shared her PB sandwich. We met Peter Candido who saw lots of Bonaparte Gulls and a Lapland Longspur on his bike ride to the end of the breakwall. Before leaving Iona, Terry and I stopped to chat with Peter and Ken cleaning bird boxes; we saw a Garter Snake, Turtle and a Rat jump from a box onto Ken’s shoulder – neat mammaling. Next Wednesday, October 10, we will do a “Ferry Outing” to Active Pass and the Gulf Islands (lots of Bonaparte Gulls there now). We will take the Salt Spring ferry that leaves Tsawwassen at 10:10 a.m. and return on the 5:00 p.m. Schwartz Bay ferry (arriving Tsa at 6:40 p.m.). Roger Meyer is preparing details, so contact him or me if you are interested in participating (see details below). Don’t forget our monthly Delta Nats meeting on Thanksgiving Monday, October 8, at 7:30 p.m. at Cammidge House, with UBC’s Chris Harley presenting on “How will BC’s coastal marine ecosystems respond to a changing climate”. Also, please volunteer if you can to assist Peter Ward and Ken Hall at their/our Bird Box Workshops on Saturday mornings and Thursday evenings in October at Peter’s home. They are making new boxes to replace Delta Nats boxes at BBRP. As usual, comments welcome and, if this verbose stuff is annoying you, tell me and I will remove you from my List. Here are some details the group might be interested in regarding next Wednesday. Ferry to the Gulf Islands: Leaves Tsawwassen at 10:10 am and arrives at Saltspring at 1:10pm after stops on Galiano, Mayne, and Pender Islands. – this gives us one hour in Ganges to wander, have coffee, eat, etc. – this gives us about an hour to browse Fulford Harbor. This entry was posted in *DNCB, Cooper's Hawk, Iona, Red-tailed Hawk. Bookmark the permalink.